By default, Beaver Builder is enabled only for Pages. See the Related Articles for how to enable Beaver Builder for Posts and custom post types. There are some things to keep in mind when you use Beaver Builder for Posts. 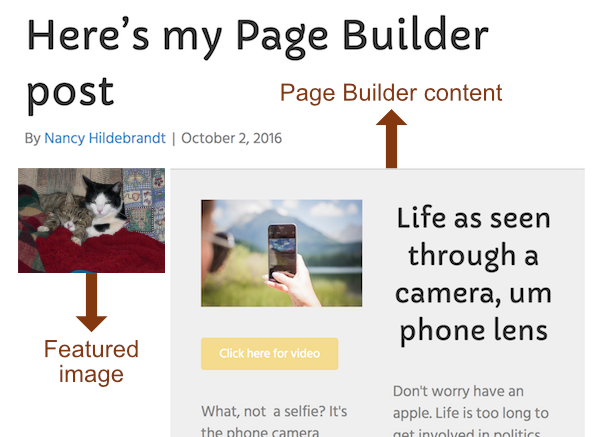 You can use Beaver Builder to create layouts in the content area of single Posts. 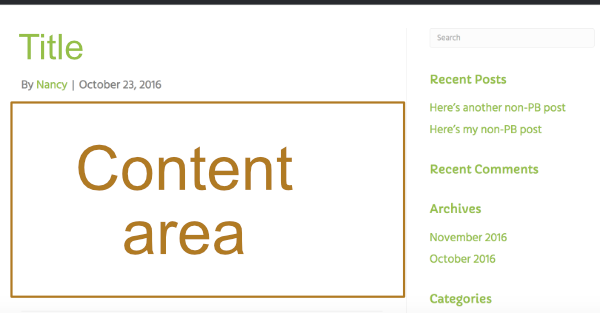 Here's a diagram of the content area in a Post. 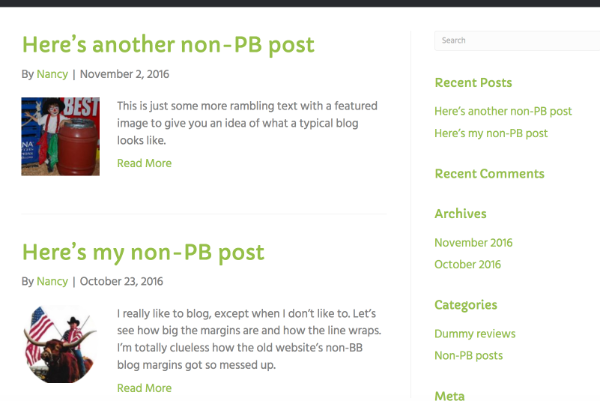 Here's a Post with a Beaver Builder two-column layout in the content area. In this example, the first column includes a Photo and a Button module. The second column has a Heading and a Text Editor module. If you enable Beaver Builder for Posts, you don't have to use it for every Post page. The index and archive pages will include both formats and display the same (unformatted) information for each. The single Post's header, footer, sidebar, Post title, featured image, post info, and post navigation are outside of the content area and are configured within the Beaver Builder Theme in Customize > Content. If you use a Beaver Themer Singular-type theme layout to design the parts of the single post page that are outside the content area, you can no longer use Beaver Builder to edit the content area of the post. On your index or archive page, the text from the modules will display unformatted and in the same order as for mobile stacking: across columns and then down. The screenshot below shows how the two-column content layout in the previous screenshot appears in the content excerpt in an archive. Tip: The single post WordPress editing page has an Excerpt field where you can type in a custom excerpt that will appear in the archives instead of being extracted from the single post content area. If you can't see the Excerpt field, click Screen options in the upper right corner and select the Excerpt checkbox. The featured image is optional. If you set a featured image, it's usually displayed in the excerpt in a generated WordPress archive, as shown in this screenshot. Whether and where the featured image is displayed depends on your theme's settings. In the Beaver Builder Theme, you can configure it in Customize > Content > Post Layout. Tip: On a single Post page, the featured image is not considered part of the content area. This means that if the featured image is set to display beside the post, it will push the content area to the right, as shown in the following screenshot. Tip: If you use Beaver Builder Theme and build your Posts with Beaver Builder, you can place the featured image inside the content area with the following setup. In Customize > Content > Post Layout, set Featured Image to Hidden. Open the Post for WordPress editing and upload the image to the Set Featured Image section in the lower right pane. This makes the featured image display on the archive page or in a Posts module. Open the Post in Beaver Builder and put the same featured image into a Beaver Builder module wherever you want it. Although it's the same image as the featured image you set, it's not treated as a featured image and appears only in the content area of the Post, not on the archive page or in a Posts module. Similar to Pages, if you want to reuse a layout that you create in a Post, you can save the entire content area as a layout template, or you can save individual rows or modules. You can reuse these layouts on both Pages and Posts. See the articles on how to save modules, rows, and layout templates. Tip: If you want a row or module to have identical and synched content wherever you use it – in other words, updating it in one spot updates it everywhere else – save it as a global object. See the article on saving rows and modules. 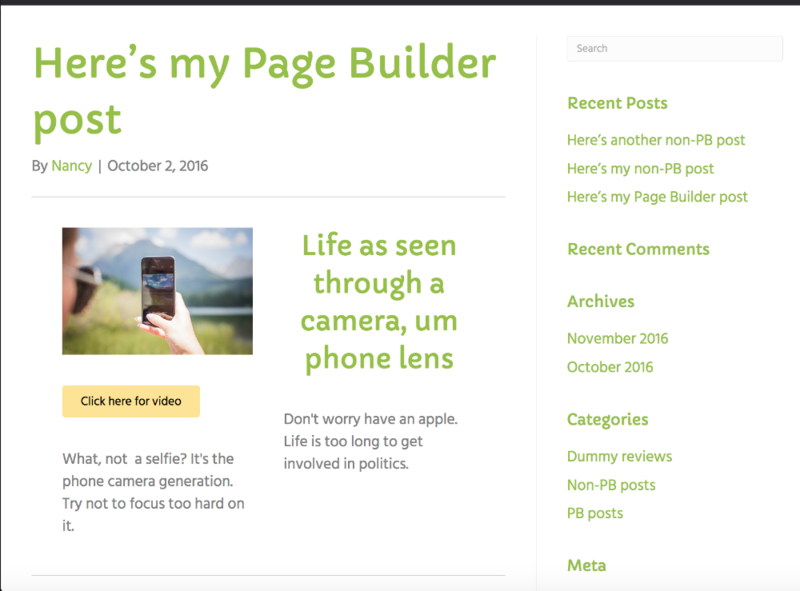 If you use the Beaver Builder Theme, you can set individual Posts to full width or no header/footer by changing the WordPress page template for that Post. See the article on using the WordPress page template for more information.